All my life I've come up with nicknames for people — mostly for those who I don't know their real names. For instance, there's the elderly woman that lived with her extended Vietnamese family. It was her, one of her children and their spouse, and boy and girl grandchildren. Every afternoon she'd do a lap around her apartment building, shuffling along the sidewalk, I assumed for exercise and to get out for some fresh air. Her face was very wrinkled and reminded me of one of those old-fashioned craft dolls with a dried apple for their head. She became know as Grandma Vietnam. There are a number of characters at my mother's assisted care facility. Today I will tell you about Twinkle Toes. Now Twinkle Toes is a bit of a misnomer. It's her eyes that twinkle, not her toes, but for some reason Twinkle Toes seems to fit and 'toes' always follows 'twinkle' in my mind. She has a bad curvature of the spine and walks hunched over. In that way she reminds me of my Grandmother, my mother's mother, who had it so bad that she eventually faced down towards the ground. Yesterday I had a very interesting interaction with her on my Tuesday visit to see Mother Dear. I've seen Twinkle Toes around and her painful-looking posture makes it easy to remember her. The more and more time I spend there, there seems to be fewer people and less space. It's in my experience because now all the faces are familiar and the building's layout is as well. Mom was in the recreation room when I arrived. She was watching them play Wii bowling on the big screen television. The facilitator was carrying on and trying to make it interesting for the whole room instead of just for the three that were able to play. (He had to keep telling The Slapper to keep her hands to herself since she was all over one of the men.) I, too, joined in with cheers for the strikes and spares, oohs and aahs for the near misses, and groans for splits. When it was time for dinner, I got Mom up and headed to the dining room. We stopped at the restroom to see if she needed to go, but she didn't, so we continued on to get her seated. As we were walking in, I'm about 2 steps ahead of Mom so she can follow my lead. Twinkle Toes was giving her attendant a hard time. I've seen her do that before, abruptly pulling her arm away when one of the nurses tried to take her hand and guide her. Twinkle Toes was pointing at me and smiling, her eyes twinkling. She doesn't speak but we could tell she was indicating something to the attendant about me. Attendant: [To Twinkle Toes.] Yes, he's bringing his mother in to dinner. Twinkle Toes holds up her hand to me as we approach, and I take hers in mine. Attendant: Do you know her? Me: [To attendant.] No. [To Twinkle Toes] But I sure do see her around all the time. We pass each other in the hall and I see her in the recreation room. In fact, she sits right across the table from my Mom at dinner! Twinkle Toes's smile grew wider and her eyes squinted. 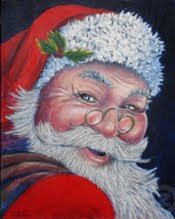 It made me think of Santa Claus and how he's usually depicted. I let her hand go. Me: Okay, everybody, let's go. We have to sit down because it's dinner time! Twinkle Toes turned and headed right for her seat. What had been a struggle of persuasion a few minutes earlier became easy. I sat Mom in her seat, pushed her chair in, and said my usual "Hello Ladies" to the group already there. Those that used to be leery of my presence now smile back and those that can speak always say "Hello" in return and sometimes I even get a 'How are you?" I'm trying to be more mindful of speaking to and acknowledging everyone to whom I come in contact. I'd say that 90% of them get no visitors at all and that any recognition may be the highlight of their day. What is easy for me could mean the world to them. Twinkle Toes has never acknowledged me prior to this so it will be interesting to see if it was something that happened just in the moment or if she'll continue to like me. Santa Claus photo can be purchased here. I am still loving these entries. Makes me fondly remember my visits to my mom's home and all the characters that I'd see there. I have characters on my street that I've named too. I have Shrek (a big ogre-type guy who just grunts and paces all day) and Bobble-Head (a skinny old man with a huge disproportionate head) to name a couple of them. citygirl--Those are some great nicknames!